Deliver consistently strong performance and solid results, occasionally exceeding expectations in his/her current role. Demonstrate motivation to succeed, and aspire to greater challenges but primarily at the same organizational level. Accept new challenges and add new skills when the job calls for it, as well as applies lessons learned to enhance success of own area. Display technical, professional, managerial & leadership skills that are expected for the current organizational level. Individual development efforts for these individuals should focus on preparing them and testing their ability to take on broader assignments. Their advancement opportunities may likely be more long-term. Target learning and development activities on specific competencies for future, target assignments. Engage them in mentoring others to development talent building skills. Put them in charge of a change management initiative. Deliver the results that are expected of them on a consistent basis but may occasionally exceed expectations. Are motivated to succeed and take on great challenges but typically at the same organizational level. Acquire new skills when necessary and can effectively apply their knowledge and experience to enhance performance. Demonstrates technical, professional, managerial, and leadership skills that are expected for his/her current organizational level. Key players may not aspire to advance to higher levels; don't pressure them to do so. Target development efforts in their current role. Focus learning on the development of advanced skills and competencies. Enhance responsibilities and scope of current position. Demonstrate that the organization values their ideas and contribution by soliciting and applying their ideas. Continuously check-in regarding willingness to advance and explore opportunities. Deliver a low to moderate level of performance and results in assignments and responsibilities. Exhibit little or no interest in taking on greater responsibilities or higher level roles. Are marginally interested in learning from experience, or in changing his/her routine, and focuses on a few narrow or specialty interest areas. Demonstrate technical, professional, managerial, and leadership skills that are at or somewhat below what is expected for current organizational level. Development efforts for these individual leaders should be aimed at clarifying job fit and improving performance. Carefully compare job requirements with individual skills, capabilities and interests. 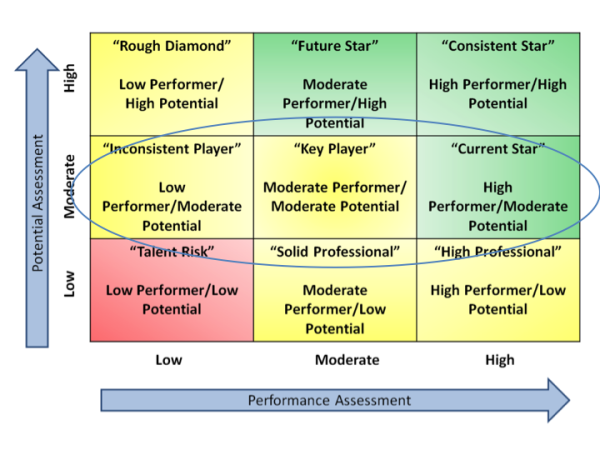 Focus development on specific competency or skills gaps to move from low to moderate/high performance. Provide targeted coaching to enhance specific skill areas. Explore additional areas of interest with a focus on building alternative skill sets. Monitor regularly to evaluate for performance improvement and re-asses potential. Part 3 of Use the 9 Box to Development Talent in Succession Planning will focus on development of individuals assessed as having a Low level of Potential. Stay tuned! Subscribe to our blog to be among the first to read it.